After spending almost all of the '90s digitizing paper maps and turning its analog information into spatial data, Pražská Plynárenská (PP), the Czech Republic's natural gas provider, introduced the ArcGIS platform to its operations in 2006. At the time, an app with a number of industry-specific tools was designed for use both on a desktop and online. By 2015, however, PP needed to upgrade its GIS technology. "The former GIS was dependent on third-party extensions that provided industry-specific tools," said Vaclav Wiesner, who was a business analyst at ISE, PP's IT company, during the project. "There was also a need to adjust the whole system for the Esri standard data model. Another requirement was to upgrade [the] current web client and to create a mobile one." While most of PP's data is only accessible internally, some of it needs to be shared with other companies, such as maintenance businesses or surveyors. 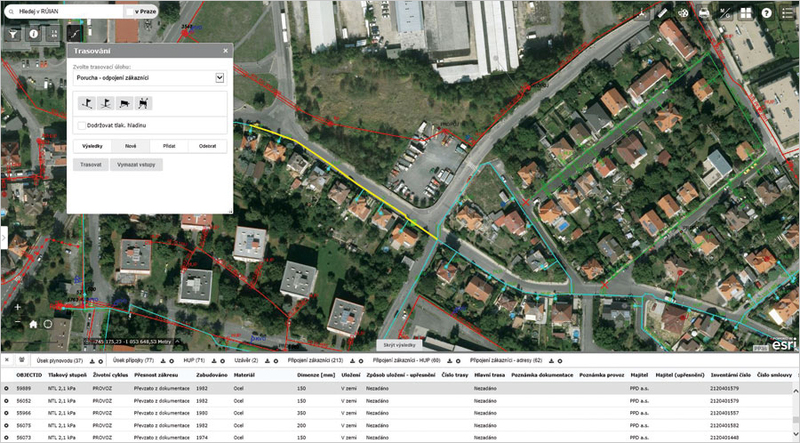 To make its data and GIS available to a wider range of its own employees, as well as associated organizations, PP launched NOKOGI (a Czech acronym for New GIS Concept), a project to remodel its GIS workflows. The concept of the NOKOGI project was to employ standard ArcGIS technology to really open up the system. "A large analysis of current tools, third-party extensions, and customized tools had shown that most of the functionality [could] be provided by standard or cleverly extended ArcGIS tools," explained Wiesner. Pražská Plynárenská (PP) employees can use the new GIS to do advanced network analysis, such as tracing. Developers weren't bound by the former technology, and they focused on replacing overcomplicated functions with much simpler ones. Using Web AppBuilder for ArcGIS, they created one app that contained various web maps of the utility network, and with AppStudio for ArcGIS, they built a corresponding mobile app. PP determined that, from there, the company's GIS administrators could use these app builders to customize and adjust the tools—as well as build new apps and update old ones—since neither requires any coding. With its underlying HTML5 technology, the PP app can be used in web browsers on various devices. This cultivates a unified user experience among office employees and fieldworkers. Since employees throughout the company perform different jobs, designing the workflow for an enterprise GIS requires determining which workers do which jobs and what tools they need to get those jobs done. Although desktop apps are very powerful and have all the tools necessary for administering and visualizing spatial data, only the GIS specialists at PP—who prepare, manage, and edit geospatial data—really need such complex software. Most employees at the company only require a light and simply designed web app, which is what the NOKOGI development team created. The web app is powerful and easy to operate. It has become one of the most important and used GIS tools in the company. The app is connected to the company's data via ArcGIS Server. And the content in the app is controlled by web maps that are tailored to various utility management tasks, such as dispatch, maintenance, and business development. One of the web app's principal features is its broad availability. There's no need to install a desktop version because employees throughout PP can access the app on any computer or device that is connected to the portal. Its interface is responsive, too, so it adjusts as it loads. NOKOGI developers took advantage of the range of standard and custom widgets available in Web AppBuilder for ArcGIS. They applied the Geocoder widget (which is now the Search widget) to let PP use its own geocoding service. With this, the organization can import data from the Czech Republic's Registry of Territorial Identification, Addresses, and Real Estate, which contains information about buildings and, more importantly, their addresses. 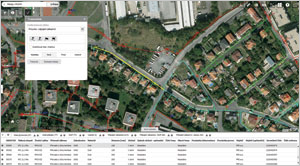 Another widget can access real estate data from the State Administration of Land Surveying and Cadastre. The app also contains a widget for drawing and taking notes directly on a map, making it easy to highlight certain areas or add short descriptions. Users can save these compositions and print or share them with others. Tracing is another critical tool for certain departments at PP, such as the dispatch center, which often needs to find a route to the closest valves or locate customers affected by an outage. This wasn't easy to do in the old system, but the new app's tracing widget allows users to launch a number of tracing tasks directly from the web app. Additionally, smart presets enable users to start up a tracing task repeatedly and change just one or two parameters to evaluate various scenarios when planning maintenance, for example. Perhaps one of the biggest achievements for the NOKOGI project was integrating PP's GIS into its other information systems, namely, PTIS (a Czech acronym for the Operational-Technical Information System), which the company uses to develop, build, and manage its entire network of gas lines. Now, GIS is one of the main data sources for PTIS. The connection between the company's GIS and PTIS is synergistic, meaning a lot of their systems work together and are interactive. A graphic representation feature, for instance, lets users draw and update custom features on a map that are linked to various projects and operational events in PTIS. This makes it easier to highlight any areas affected by an incident in PTIS or roughly locate a PTIS item on the map. Thus, users can create representations of planned projects or visualize service issues like outages. In the utility industry, demands on the reliability and accessibility of an IT system are very high. When disasters such as floods or blackouts occur, having up-to-date data about the network is imperative. That is the only way a utility company can know what parts of the network have been affected, who lacks service, which nearby areas are in danger of experiencing outages, and which facilities are at risk of being impacted. When PP workers are on the go, they can usually access the web app on their mobile devices using a browser and a VPN. However, for times when the Internet isn't working or cell service is down, NOKOGI developers used an ArcGIS Runtime SDK to create a special offline solution that keeps PP's data current both on employees' desktop computers and their mobile devices. This solution also includes tools that keep offline copies of network data up-to-date and accurate, so the app doesn't have to download the whole database each time something gets updated. Developers finished building the app last year, and so far, PP employees really like it—especially the user experience and its integration with other enterprise systems. They report that it is more user-friendly and intuitive than the systems they were using before. Staff enjoy having a large map window and access to widgets, and they like being able to change basemaps with one click or tap. They also find full-text search a big help and, perhaps most importantly, appreciate being able to work while on the go or offline under treacherous conditions. The NOKOGI project was completed by ISE, Arcdata Praha (Esri's official distributor in the Czech Republic), and Czech IT company d-PROG.